The 'Mystery Sonatas' are among the most intriguing compositions of the 17th century. 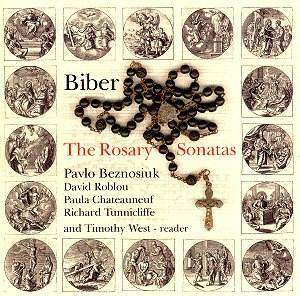 Nowadays they are certainly the most popular of Biber's compositions, as the number of recordings indicates. The catalogue already contained a handful, and at the occasion of the tercentenary of Biber's death, another handful was added last year, two of which are to be reviewed here. The collection consists of 15 sonatas for violin and basso continuo, with an added Passacaglia for violin solo. The title page of the manuscript has disappeared. Therefore it is not known what Biber called the collection. Nowadays they are usually referred to as 'Mystery Sonatas' or 'Rosary Sonatas'. The reason is that in the manuscript every sonata is preceded by an engraving showing stages from the life of Jesus and of his mother Mary. These can be thematically linked to the mysteries of the Rosary. 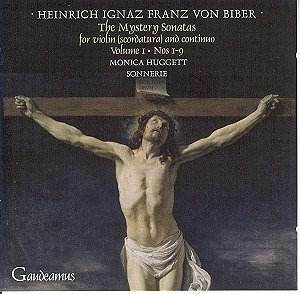 The collection is divided into three groups of sonatas: the 'Joyful Mysteries' (Sonatas I - V), the 'Sorrowful Mysteries' (Sonatas VI - X) and the 'Glorious Mysteries' (Sonatas XI - XV). As the engraving which precedes the concluding Passacaglia shows, an angel holding the hand of a child it is often labelled 'the Guardian Angel'. A particular feature of this collection is the use of the 'scordatura' technique, meaning that one or more of the strings are retuned as indicated at the start of the sonata. This can hardly come as a surprise: although Biber wasn't the only composer to use this technique, he prescribed it more frequently than any other. With the exception of the first Sonata and the Passacaglia all sonatas require retuning, resulting in 15 different tunings throughout the collection. There are a number of questions regarding these works, which still can't be answered with certainty. One of these is when and for which occasion they were written and under what circumstances they were performed. It is thought they were written around 1678. They were dedicated to Max Gandolph, the archbishop of Salzburg and employer of Biber. From the dedication text we learn that the archbishop strongly promoted the worship of the Virgin Mary and Rosary devotion in particular. The fact that these sonatas were never published has led to the assumption that they were written to be performed - probably by Biber himself - in Max Gandolph's own chapel, during his meditation about the mysteries of the Rosary. But others suggest they could have been performed in the Aula Academica, the lecture hall of the Jesuit confraternity in Salzburg. The hall contains fifteen paintings depicting the mysteries, and the Jesuits strongly advocated Rosary devotion via music. Another question relates to a connection between the music and the mysteries of the Rosary. There have been attempts to present the sonatas as depictions of events in the life of Jesus and his mother. Some musical figures can be interpreted as illustrations of particular events as described in the Rosary psalters of the time. However that doesn't make these sonatas 'programme music'. One has to assume that Biber uses affective and rhetorical commonplaces to stimulate meditation about the mysteries. In this regard it is appropriate to explain the term 'meditation'. Nowadays music presented as 'meditative' is mostly soft and unobtrusive, allowing the listener to dream away and sink down into himself. However the latin verb 'meditare' also means 'study thoroughly' or 'practice'. In the liner notes of Pavlo Beznosiuk's recording James Clements writes that "by contemplating the image, reading the texts, and hearing the music, individuals were supposed to create a mental picture of the mystery, often in minute detail and at great length". And Wiebke Thormählen, in the booklet of Sonnerie's recording, says: "Graphic sound painting has parallels in much counter-Reformation art which seeks a powerful immediacy of visualisation with the depicted emotions, but provoking so strong a reaction that his emotions are heartfelt rather than merely sympathetic". This explains the often strongly dramatic music to be found in this collection which is disturbing rather than 'meditative' in the modern sense of the word. The recordings reviewed here have their own idiosyncrasies. In Pavlo Beznosiuk's recording every sonata is preceded by a reading from three Rosary psalters held in the British Library. This is a very nice and interesting concept, as it provides the listener with the spiritual context in which these sonatas have been performed. But one wonders whether the listener wants to hear these readings every time he plays the discs, even though the reading by Timothy West, one of Britain's most prominent actors, is outstanding in every way. But they are on separate tracks, so it is possible to skip them. Whereas in Beznosiuk's recording several instruments are used in the basso continuo part - viola da gamba and violone, theorbo and archlute, harpsichord and organ - Sonnerie goes even further in using also a lirone, a guitar and a harp. There are different opinions as to which and how many instruments should perform the bass part. The answer to this question partly depends on where one thinks these sonatas were performed in Biber's time. If they were meant to be performed at the private chapel of archbishop Max Gandolph, then it is very unlikely that more than one keyboard instrument would be used, perhaps with the addition of a string bass. Even that practice is only based on the indication of 'violone solo' in the bass part of Sonata XII. That doesn't necessarily mean a string bass is required in all sonatas. If one believes that the sonatas were played in the Aula Academica in Salzburg, then it is perhaps possible to imagine a performance with an additional plucked instrument. Even so, it seems to me hardly justifiable to use a harp and a guitar. I haven't heard or read any evidence that these instruments were used in Austria at the time. And as effective the use of the lirone, with its soft and plaintive sound, may be in the 'Lamento', the first section of the Sonata VI, and in Sonata IX, this instrument - like the guitar and the harp - was mainly used south of the Alps. As there are uncertainties about the composition and the content of these sonatas different approaches are legitimate. And the recordings by Pavlo Beznosiuk and Monica Huggett are very different. This is interesting considering the fact they are both British and have often played in the same orchestras, sometimes even alongside each other, for example in the Amsterdam Baroque Orchestra. Pavlo Beznosiuk in general avoids strong dramatic contrasts. His tempi are generally slower, and he is also more moderate in the use of dynamics. As much as I think this approach is defensible, I nevertheless believe there are some major flaws in this performance. My main criticism relates to the legato playing and the lack of differentiation between the notes. The praeludium of Sonata I makes that immediately clear: all notes get equal weight, although it is very obvious that many notes are only there to link the really important notes together. This reflects the baroque principle of 'music as speech'. In her recording Monica Huggett is very aware of this: the clear differentiation between notes is one of the features of her performance. As a result her interpretation has a far stronger narrative character. Baroque music is basically telling stories, even though we may not know the stories. Ms Huggett also uses a far wider range of dynamics and has a more flexible approach to tempo. In general her interpretation has much more tension than Beznosiuk's, whose performance is rather tame and pale in comparison. Although the liner notes try to explain - in much more detail than the Sonnerie booklet - the content of the sonatas and the possible descriptive traits of them - sometimes rather speculative, I would say - too little of that is realised in the actual performance. In spite of the interesting concept of adding readings from Rosary psalters I find it hard to recommend this recording. Technically and from the perspective of interpretation Monica Huggett is vastly superior. But I have some problems with her recording as well. It is certainly legitimate to approach these sonatas from a more dramatic angle, but I feel she is going over the top sometimes. The most striking example is Sonata XIV: I thought I was listening to a piece of Italian or Spanish music, considering the strong dynamic accents and the percussionistic playing of the harpsichord and the guitar. It is all very exciting, but has not that much to do with Biber. The performance of the basso continuo part is often stylistically very dubious: in this sonata the basso continuo instruments are far too dominant, sometimes even overpowering the violin, and there is a continuous shift from harpsichord to guitar and back. And in Sonata XI it is the organ which plays a concertante role from time to time. Overall the basso continuo is just too much fuss and feathers. When I started the listening session I was really disappointed with Pavlo Beznosiuk's performance. In comparison Monica Huggett's recording was like a breath of fresh air. But after a while I started to get annoyed by those aspects I believe to be unidiomatic, and in conflict with the character of Biber's music. 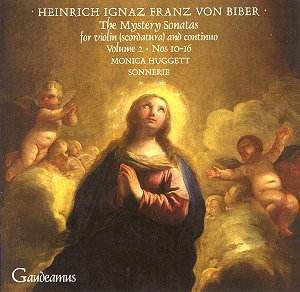 I was hoping Monica Huggett would be an alternative to what was my favourite recording so far: Reinhard Goebel and Musica antiqua Köln (Archiv) AmazonUK. But I have decided that I have to stick to Goebel: to me his recording does most justice to all aspects of these brilliant sonatas of one of the greatest composers of the violin of all times.